Fully automatic, all stainless steel, hot melt glue, tray/carton former capable of speeds from 10 to 40 cpm (depending on size, shape and materials). Has tray/cartons size range of: (6" – 16 1/2"L) x (3 1/2" – 17""W) x (3/4" – 3 1/2" D), blank size of (5" -18 1/2"L) x (7 1/2" – 18"W). Change parts required for size range. 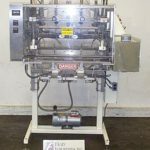 26"L Blank magazine with gravity pusher plate, 4-cup dual arm reciprocating mechanical pick-n-place, pneumatic tray forming head, low-force roller forming cavity, Nordson glue system, E-stop, status indicator lights, quick change forming head tooling, low blank sensor, barrier guarding with interlocks, 70" long x 12" wide discharge conveyor. MGS Model RSC-150, automatic, compact, horizontal, intermmittent motion, stainless steel, cartoner. Rated from 10 to 60 cartons per minute – depending on materials and application. Carton size range: 1" to 10" in Length; 0.63" to 4.5" in Width; 2-1/4" to 10-1/2" in Depth. Equipped with 4 chains adjustable set on 12" centers with 1-1/2" wide x 3" high lugs, 84" long product in feed conveyor with 6-1/2" long x 6" wide x 2-1/2" high fixed buckets and product feeder, blank carton magazine with recipicating suction cup pick n place, no product / no carton sensor, carton squaring device, single head product ram loader, seco gauges, interlock safety guarding and statis light bar. Control panel has A/B controller, with carton pick, speed and top compression closer and push button start, stop, e-stop controls. Mounted on stainless steel frame with height adjustable legs. MGS, Model RPP-421, topsert feeder. Rated from 25 to 400 picks per minute – depending on materials, application and machine configuration. Product size range: 1" to 10" in Width x 1" to 6" in Length. Equipped with a 97" long (2) belt powered product magazine, (4) head rotary pick n place, vacuum pump and drive motor. Control panel with an AB PLC. MGS, Model RPP-2210, invert and topsert feeder. Rated from 25 to 300 picks per minute – depending on materials and application. Product size range: 1" to 6" in Width x 1" to 12" in Length. Equipped with a starwheel package inverter, 170" long x 3½" wide vacuum belt conveyor, 96" long x 6" wide x 1¾" high powered product magazine with (2) suction cup dual rotary pick n place. Control panel with AB PLC and AB Panelview 300 Micro controls.